Arthur Miller's first successful play, All My Sons, is presented by Rapture Theatre Company in a production that seems to have something of a curse upon it; not only was leading actor Paul Shelley hospitalised before opening night (though expected to return to the production for the Inverness run), but Trudie Goodwin very nearly followed him after collapsing a third of the way through the second half of the performance. Okay, not quite - but it did seem that the heat within the Theatre Royal was too much for her and her collapse mid-performance prompted a ten-minute delay. But, ever the trooper, and epitomising the maxim, "the show must go on", the performance was resumed with renewed vigour. 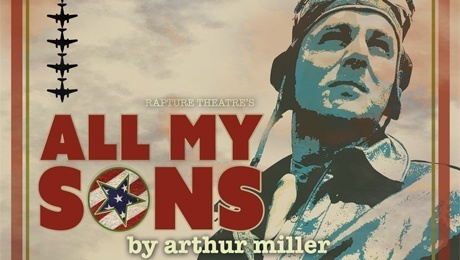 Miller's unflinching play, inspired by true events, is the story of a family, already dealing with the absence of one son, who are forced to confront the terrible truth that has been hidden for several years when figures from their past re-enter their lives. Recalling Greek Tragedy with its father-son relationships and the idea of resolution through reckoning, it's a moral play replete with definite opinions and outcomes. The principle of karma is also apparent and the conclusion, although somewhat shocking, is inexorable. The design by Neil Murray is, on first impressions, a basic clapboard house and its backyard although, upon closer inspection, it appears that one corner of the building is covered with mould and appears to be rotting. It is a rather hollow and empty design which could be said to reflect the state of affairs of the people who dwell within - their lives are something of a façade and one shouldn't look too closely at the details. It could also be said to represent the nature of the production as a whole - unrefined and not quite detailed enough. The lighting by Sergey Jakovsky is serviceable but unexciting and the sound design by Craig Johnston needs more honing and could be more consistent and subtle. David Tarkenter, understudying the part of Joe Keller, is very good in the role, as is Robert Jack as Chris Keller. Both are able to grasp the basic principles of each character and deliver them in an assured way. As Lydia Lubey, Pauline Turner also holds her own, albeit in a smaller part. Trudie Goodwin is quite excellent as Kate Keller and hers is the most thorough, nuanced and honest characterisation in a company of actors who exhibit moments of great promise but who seem to be restrained by tepid direction and thus are never really able to create thorough character arcs and sustained through-lines leaving the performances a little uneven complete with some laboured dialogue. And whilst the cast, as a whole, are never less than competent there are a number of dodgy accents and moments of stilted acting, although the humour is always delivered with aplomb, and one gets the sense that the actors on-stage are able to give even more than is in evidence if only given the chance. Michael Emans' direction is somewhat lacking in consistency, often being clunky and stale and he is guilty of some obvious and uninspired handling of the performance space and it's his labours that are the predominant cause of flaccid performances and the creation of a production where energy and pace fluctuate for the most part, although the second act does trundle along with more fluidity than the first. All in all this is a flawed production containing elements raising it beyond the mundane but it is nevertheless a fair effort of a powerful and demanding play. Should the producers and director revisit the production any time soon they would do well to build upon the successful components already present to create a more thorough and even production.